We are a leading Manufacturer of air bubble film roll from Ahmedabad, India. With the endorsement of some professionals of the market, we are occupied in offering Air Bubble Film Roll. 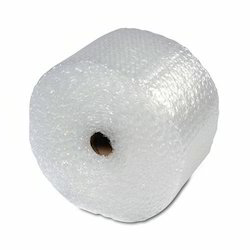 This Bubble film roll is broadly recommended by our customers due to its quality & low cost. The offered Bubble film roll is processed by our capable professionals consuming higher quality components and updated technology in adherence with predefined norms. This Bubble film roll is meticulously examined on numerous parameters in order to ensure its quality. Features: • Excellent quality • Moisture proof • Durability Other Details: • The rolls are available in varying widths of 1.0 meter / 1.5 meter / 2.0 meter in GSM ranging from 40 GSM (200 Gauge) to 140 GSM (600 Gauge). The offered product is available with a standard length of 100 meters.